Here in Texas, we have a long (and some would say loving) relationship with firearms. Even before becoming a state in 1845, early settlers found their muzzle-loaders indispensable in obtaining food and dealing with predators and unsavory reptiles. There were also frequent skirmishes with the native Comanches. Today, Texas has more gun dealers (about 8,500) than any other state according to Federal statistics. In addition, there is no registration requirement, no waiting period, and no limit on purchases. Gun control advocates are quick to demonize Texas for these reasons, but if you check the statistics, the state ranks 30th in deaths by firearms. This is better than Washington DC and Pennsylvania, each with some of the most restrictive gun laws in the nation. The debate on gun control will likely rage on, but that’s not my topic today. Rather, it’s about existing Federal and state laws pertaining to gun ownership by people convicted of domestic abuse, and how Texas law on this subject may change. First, here is a sad statistic. According to FBI and state crime data crunched by the Associated Press, a woman is shot in the US by her romantic partner every 16 hours. We all have heard that crime victims usually know their attackers – here’s some proof. 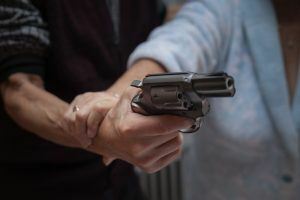 Federal and state law acknowledges that domestic abusers should not own guns, and both make buying and possessing them after such a conviction illegal. But there’s a legal wrinkle. There are no current laws requiring those convicted of domestic abuse to surrender firearms they already own. All ideology aside, I think everyone can see that leaving weapons in the hands of those already convicted of violence against their partners is a big gamble. Tempers are already running hot, and one could easily argue that the intent of current law is to keep these victims safe. If keeping these people from buying and owning guns is a good idea, then taking away those already owned seems to be a good idea too. Dallas County agrees, and the process, while very new, is pretty simple and will likely be effective. And from a victim’s rights perspective, it is a welcome process because it doesn’t need legislative approval (which couldn’t occur until next year at the earliest anyway.) Judges in Dallas County have instituted a process where domestic abusers covered by certain types of protective orders are required to turn in all firearms. If they don’t own any, they must attest to this fact under oath. Under certain conditions, firearms will eventually be returned to the original owners, in theory when a protective order expires (usually two years in Texas.) Some abusers subject to this process will never have their relinquished weapons returned. This process was launched in May 2015, so it is too new for Dallas County to have useful data on its success or failure at this point. But clearly, Texas demographics are changing, as are attitudes towards firearms. It is possible that this process could catch on in other jurisdictions. We are glad to represent clients with domestic abuse issues.